If you are looking for your next perfect vacation to remember, it is time to start planning the kind of experiences you want to have and the types of activity you want to do. The hardest part will be choosing where you want to go, with so many wonderful places to choose from, excellent food and drink to try and amazing new experiences you can carry with you forever. The planning can be exciting and fun, and allows you to make the most of the time you will have, but first you have to choose the destination. The perfect place that suits all travellers is Menorca. Whether you are a family with children, travelling with friends or just that special someone, the island has a variety of things to see and do. A popular place to visit, it has something for everyone, from beautiful beaches to tranquil forests. When you visit Menorca, be prepared to live some truly unforgettable moments on this perfect paradise island. You simply cannot miss the beautiful beaches, with their crystal clear blue waters and soft white sand that stretches away along the coast. The two sides of the island are quite distinct, with the southern coast a landscape of varied flora and fauna, and the north more rocky and sandy. If the beaches don’t blow your mind, the amazing gastronomic choice will. From lobster stew to the famous tomato based soup oliaigua, the amazing restaurants on the island are cooking up a storm. At night Menorca becomes almost magical, with the perfect places to relax and spend some quality time with your loved ones. Just watching the sunset across the tall lighthouses and untouched little coves will be a memory you cherish forever. The sea around Menorca is charming and tranquil, with gentle waves that break lightly on the shore. The best way to explore is by kayak, slowly making your way round the numerous small islets without having to go far out to sea. You can even make your way right up to the mouth of the port to see the imposing Fornells Tower, a defensive outpost built by the English in 1802. To really enjoy this incredible place to the full, it is recommended to line up as many activities and excursions as possible, and it is easy to find a wide variety of offers and packages to help with this. The excursion packages offered by Katayak include a choice of kayaking, diving, hiking, cycling, horse riding and jet skis. All managed by a team of people with extensive experience in travel and tourism, who have planned the trips and activities to be fun for all those who go but also responsible and safe. Perfect for families, friends or couples with a sense of adventure. 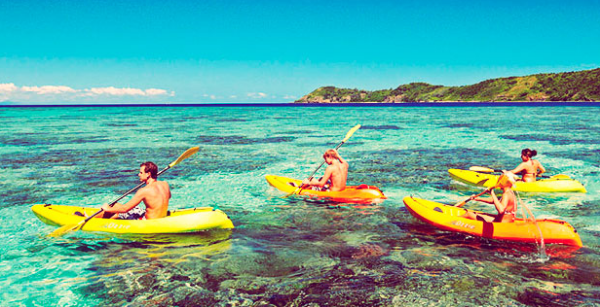 If you want to enjoy every inch of this spectacular island, there is no better way to do this than on board a kayak. They allow you to explore the coastline from a completely unique point of view, allowing you access to otherwise inaccessible places. Kayaking is so simple to learn, and can be a group activity or solo. The possibilities around the Menorcan coast are endless, whether you choose to have a planned excursion accompanied by an expert guide or would rather set your own course for adventure. Kayak rental in Menorca is easy, just take a look at the price and your budget and there are sure to be deals that suit you. It is the perfect way to travel the Menorcan coastline from end to end with no impact on the ecosystem – it is completely environmentally friendly. There is also a wide range of choice of kayak, so that whatever the clients needs, there is something that will accomodate them and their intended route. Some models are even designed with beginners in mind, so if you do not have the experience yet then it is reassuring to be in a safe and stable kayak. It is also possible to have assistance with navigation, hints and tip and where to visit. It is important to feel safe and secure to be able to enjoy it to the maximum. If you want the sea experience, but perhaps a kayak isn’t for you, the other popular option is a modern catamaran. Again great for families, friends or couples and allows a lot more space, stability and better buoyancy. A great, fun and safe way to travel. The boat is very maneuverable, usually with two engines to make controlling it much easier. It is entirely possible to do a 360 degree turn within the length of the boat. Also catamarans do not have deep hulls and so can be anchored in shallow bays, close to the beach. It doesn’t take long for your crew to become accustomed to the handling and navigate easily through small spaces, for example when docking. It is definitely a more comfortable way to enjoy cruising up and down the spectacular coastline of Menorca. Even better there are a range of catamaran rental packages in Menorca with responsible, professional rental companies, who can guaranteed excellent quality and maintenance of the rental boats. Although the catamaran excursions are definitely worth a try, there is something special about being so close to the water and in control of your destiny as you get with a kayak. Menorca kayak expeditions allow you to enjoy the most unspoilt part of the island, with so many other opportunities to stop and explore. For example exploring the cliffs, lounging on the beaches or venturing into caves…. there is so much to choose from. The kayak trip allows each visitor to discover for themselves all the secrets of the island, and they can’t help but fall in love with the beauty of this very special place. Touring this wonderful island, so full of surprises, is well worth a visit. If you get the opportunity to also take a guide with your kayak rental, you should take it. Know one knows the island like these guides and they are available all year round, including the off peak seasons.